Enjoy Alessi Pomodori Risotto. Imported. Made With Italian Arborio Rice With Sun Dried Tomatoes. Italy Is Europe's Largest Producer Of Rice. The Wetlands And Cool Temperatures Of The Lombardi Region Harbor The Ideal Conditions For Lush Rice Fields. Resourceful Italians Combined Rice With The Many Other Items Common To Their Area And Developed A Dish They Lay Claim To. It Is Known As Risotto. Rich, Creamy Risotto Is One Of Northern Italy's Gastronomic Delights. 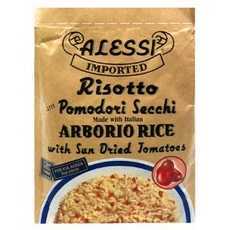 They Key Ingredient In Authentic Risotto Is The Short, Thick Grained Rice Known As Arborio. This Rice Is The Perfect Grain For Risotto Because Its Texture And Cooking Properties Allow It To Retain Firmness Throughout Preparation. Risotto Should Always Be Prepared Al Dente, Which Means Tender Yet Firm To The Bite. Alessi Risotto Con Pomodori Secchi Is An Easy To Prepare Culinary Treat. The Sun Dried Tomatoes Used In This Product Are From The Farmlands Of Sunny Italy. Handpicked While Juicy, Red And Fragrantly Ripe They Are Then Split In Half, Salted And Laid Out On A Large Wooden Flat To Dry In The Sun. This Has Been A Traditional Yet Popular Dish Throughout Northern Italy. This Dish Is A Wonderful Accompaniment To Most Grilled Meats, Especially Chicken. (Note: Description is informational only. Please refer to ingredients label on product prior to use and address any health questions to your Health Professional prior to use.